Slopes covered in aspens and evergreens flank the Hunter Creek valley floor above Aspen. ASPEN – Hike or bike up Smuggler Mountain Road next summer and you may need to move aside for a logging truck rumbling down the newly graded road. Stand at the observation deck and you may hear the growl of chain saws working a forest patch cut. Cross over into the Hunter Creek valley and you could see a helicopter airlift a load of lodgepole pines with the wop-wop sound of its rotors. Walk the Hunter Creek Trail and you may sniff the acrid odor of a prescribed burn as smoke plumes into the mountain air. 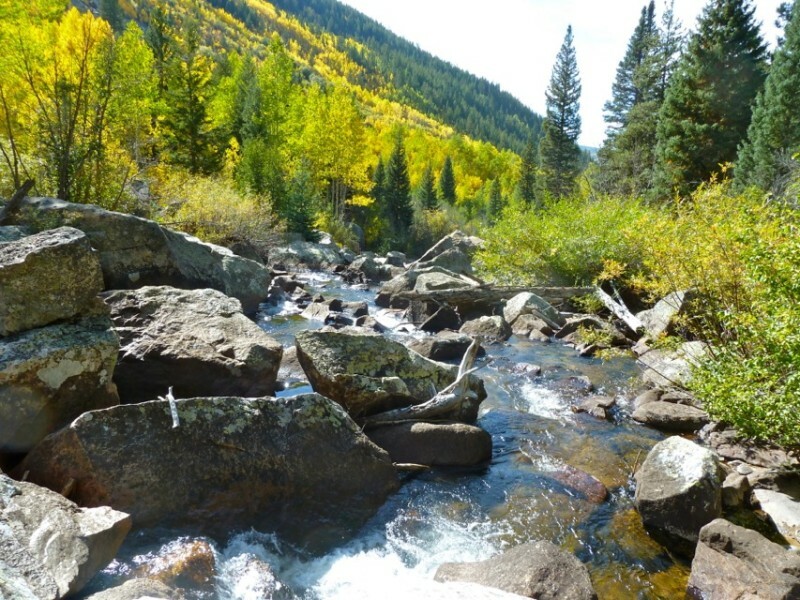 To what extent it happens depends on a key decision that falls to White River National Forest Supervisor Scott Fitzwilliams, a decision that will officially launch the Hunter Creek-Smuggler Mountain Cooperative Plan. No work is planned this winter, but there are likely big changes coming to the 4,681 acres covered by the plan when the snow clears and the weather warms in 2014. The plan encompasses most of Smuggler Mountain Road, from Aspen to the Robbie Wade Picnic Area more than a mile above the Smuggler observation deck. It includes the Hunter Creek valley, from the north entrance to the end of the big meadows east of the old dam keeper’s cabin near Thimble Rock. And it wraps around Red Mountain and Van Horn Park to include some of the most popular trails in Aspen. This far-ranging plan was initiated five years ago to enhance forest health and wildlife habitat, protect public safety, improve trails and roads, and provide outdoor education. Exactly how that translates to action is the hard call Fitzwilliams and his staff are currently weighing. Considerable input for the plan has been channeled to the U.S. Forest Service from its partners – the city of Aspen, Pitkin County, and the Aspen Center for Environmental Studies (ACES). Public comments add to the mix with a complex set of often-contrary positions that Fitzwilliams must apply against the Forest Service’s preferred alternative. Consider, for example, how one citizen feels about adding signage to the area, a relatively innocuous part of the plan designed to describe the work in progress to forest users, help them navigate the trail network, and better understand forest ecology. “The presence of signs at every intersection, trail entrance, etc. 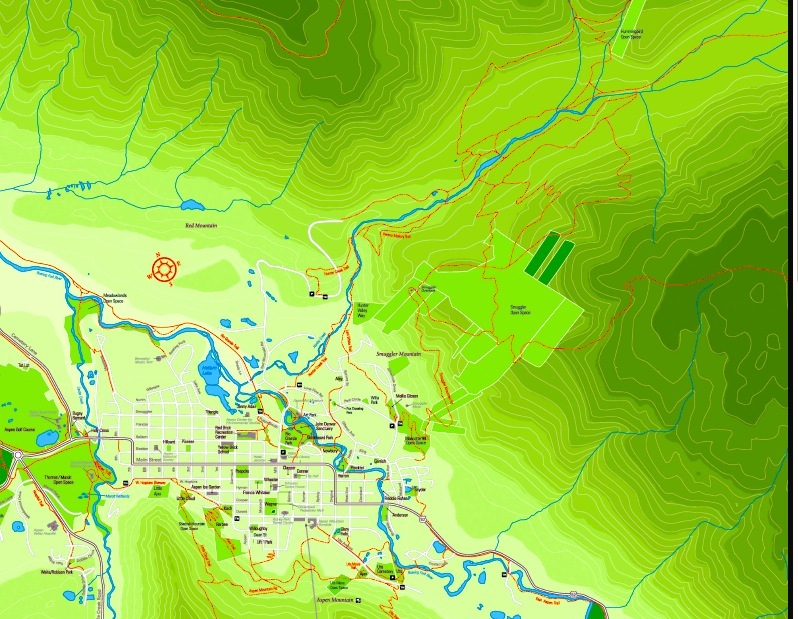 depicting directions, difficulty of topo and more, reduces the sense and experience of wilderness,” Lucy Nichols of Aspen told the Forest Service. “Rather, one will feel as though this is a controlled environment, indeed more like a ‘park.’ This is counter intuitive to the reason most people hike or mountain bike in the first place. When I am hiking, I am not seeking reminders of mankind, our presence, or our attempt at control every inch of backcountry,” Nichols said. Other, more controversial, projects include clearing forest “patches,” closing and rerouting some hiking and biking trails, and prescribed burns of oak brush and other understory shrubs. It is all part of an extensive makeover for the area scheduled through 2034. Typically, it isn’t until a project of this magnitude begins that Aspenites come out of the woodwork to address it. And given the scope of forest work on Aspen’s backcountry doorstep – and the numbers who frequent it – there will likely be plenty of public reaction over the next two decades. According to trail-use studies, an average of 355 hikers and bikers climb Smuggler Mountain Road to the observation deck every summer day during peak season. That number has soared to 600 per day. Beyond the observation deck, an average of 125 forest users go down into the Hunter Creek valley to hike and bike the trails there. It is no wonder then that Fitzwilliams has deliberated more than a month since the last public comment period to make a decision that could help define his career in the Aspen community. Not only will the supervisor of the 2-million-acre White River National Forest face public scrutiny, he will be accountable to the partners who have helped shape the plan. Wilderness Workshop has filed the most substantive of 69 public comments on the plan, which was put out for review in January and followed by a draft environmental assessment issued in September. The recent letter – signed by the city, the county, ACES and Wilderness Workshop –called for changes to the plan before the Forest Service takes final action, raising the stakes for Fitzwilliams and his decision on the final Hunter-Smuggler plan. At the start of 2014 the most visible impact of the plan may be grading Smuggler Mountain Road. Many hikers and bikers are familiar with every inch of that rough-hewn track, so any changes may seem out of character. The grading, which will include water bars, swales and ditches, is prescribed to improve drainage and road surface. This is being done, in part, to accommodate vehicles necessary for logging and other forest management projects. While the plan pledges to respect non-motorized traditional uses, it rationalizes the need for “improvements” that may make the road feel like a step toward something that many longtime users would rather not see, as change to iconic mountain byways is not taken lightly in the upper Roaring Fork Valley. The plan also calls for temporary road and trail closures to coincide with work done by heavy equipment, chain-saw crews, prescribed burn teams and helicopters. Signs will be posted to alert the public, who can expect interruptions in access to lands that form the most accessible backdrop to Aspen’s urban core. The most mechanically intensive and potentially disruptive project will be the cutting of small sections of lodgepole forests in multiple locations throughout the plan area. Almost 300 acres of lodgepoles are targeted for “patch cuts” that could create up to two-and-a-half-acre clearings. In roadless areas, where trucks can’t go, or on steep and difficult terrain, helicopters may be used to airlift logs to staging sites. Roadless areas within the Hunter-Smuggler plan are mostly found in a swath of national forest stretching from the west side of Red Mountain east to Van Horn Park, high above the Hunter Creek valley. Another roadless section in the Hunter-Smuggler area is under consideration for wilderness designation as part of Sen. Mark Udall’s Central Mountains Outdoor Heritage proposal, which originated with Wilderness Workshop’s Hidden Gems campaign. This area is on the far southeastern part of Smuggler Mountain, including the ridge top and flanks dipping toward the Roaring Fork River valley above the North Star Nature Preserve. This chunk of land is the site of the Balcony Trail, a contentious singletrack built unlawfully by trail users and defended vehemently by some mountain bikers. Push back has come from Wilderness Workshop, which calls for the Balcony Trail’s closure. Wilderness Workshop also called on the Forest Service to go beyond the two alternatives it studied in its environmental assessment – a “no action” alternative and a “preferred alternative” – and put together a third alternative without a Balcony Trail. The plan calls for a variety of trail work to improve trail user conflicts and mountain bike rideability, while reducing wildlife impacts and erosion. Only one existing trail is planned for closure – the short connector from the Iowa Shaft that drops down into the Hunter Creek valley. 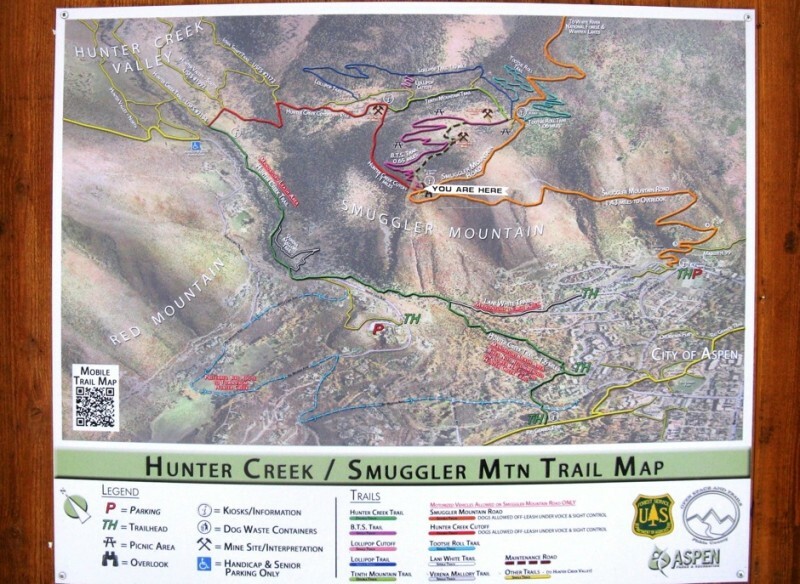 Two new trails have been proposed for construction – the Hunter Ditch Loop in the upper valley and the Hummingbird Traverse, which would drop down to the valley floor from the Hunter Creek Road at the upper turnoff to Four Corners. The plan identified several popular trails and trail sections as “considerably degraded, very difficult to ride or hike, poorly drained and steep, and generally in bad condition.” Work on these trails will include resurfacing, filling ruts and holes, fixing trail obstacles, installing boardwalks or drains, and putting up new trail signs. 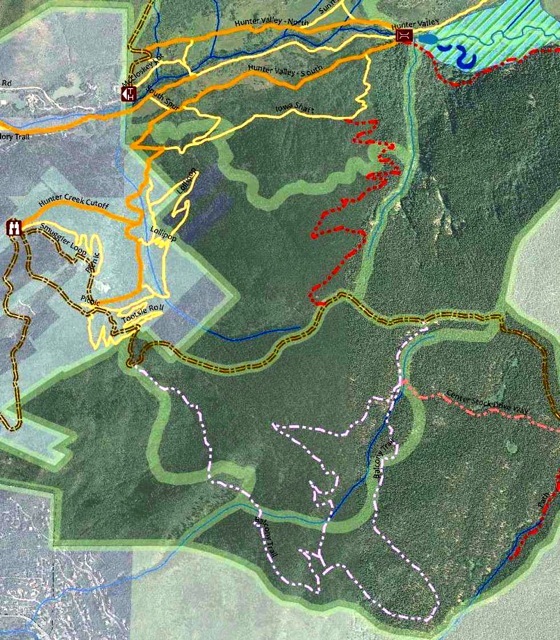 But the trail that generated the most comments to the Forest Service about the plan was the Balcony Trail. This “bandit trail” was built over the last decade on national forest land south of the observation deck on a large, sloping, timbered bench. Because the Balcony Trail has never been brought into the legal trail system, Wilderness Workshop insists that the plan and the environmental assessment from the Forest Service not consider the Balcony Trail in its baseline data. That means not accommodating it into the plan until studies are done to determine its impacts on wildlife and ecology. Wilderness Workshop’s approach to the Balcony Trail has made the organization unpopular with some mountain bikers. It was the environmental group’s field researchers who blew the whistle in 2011 when they discovered and reported the bandit trail while mapping potential new wilderness. This brought a wave of derision to Wilderness Workshop from some mountain bikers who focused antagonism on its Hidden Gems wilderness effort, already the subject of withering opposition from a local bumper-sticker campaign. The mountain biking community became one of Wilderness Workshop’s chief adversaries and detractors. Signs posting the Balcony Trail as closed were stolen or thrown away a week after being installed, according to a January 2011 article in The Aspen Times. The Forest Service considered installing hidden trail cameras, but acknowledged they probably would have been stolen too. The agency then appealed to the Roaring Fork Mountain Bike Association to come to the table in a cooperative manner. Mike Pritchard of Aspen, representing the association, noted in a comment to the Forest Service that other “bandit trails” have been accepted into the Forest Service’s official route inventory, after the fact. He added that better signage benefit first-time visitors. “I support a better future version of the Balcony Trail,” Pritchard wrote. “The ideal alignment would reroute steeper sections and maintain the big views. I would hope and expect to encounter big game animals in this terrain, and feel that the density of use by cyclists would be compatible with wildlife. I believe the biking community would be open to seasonal closures for wildlife during shoulder seasons. Today, the plan tends to mirror Pritchard’s view, as it proposes to confirm the best alignment for the Balcony Trail and reroute it where necessary to avoid wildlife habitat conflicts. 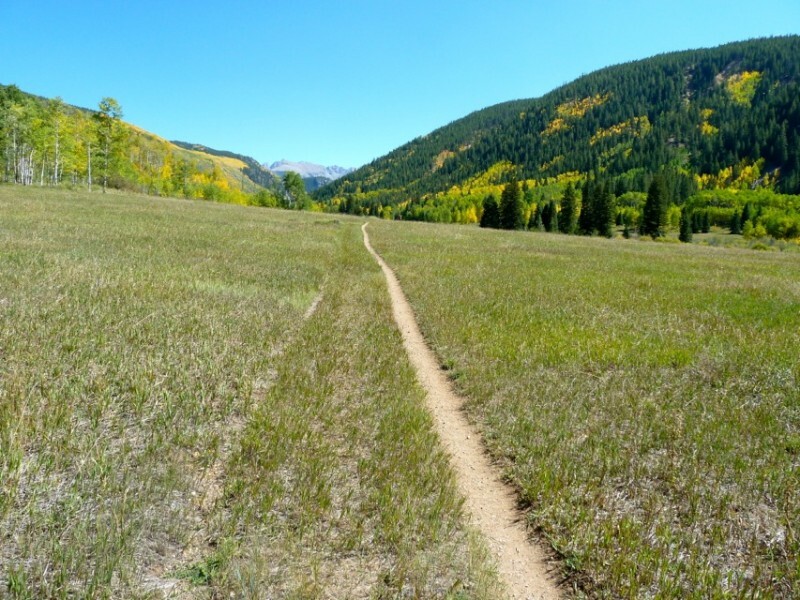 “Proper planning at this time, coupled with community trust and the appropriate management and enforcement will ensure that the trail remains an important, sustainable component of Aspen’s recreational trail network for decades to come,” it states. On the other hand, the plan also issues a warning. Brent Gardner-Smith / Aspen Journalism. It is clear that humans are not the only fans of the Hunter Creek valley. Elk, for example, like the aspen trees there.Smith / Aspen Journalism. Logging and other forest management techniques are a major component of the Hunter-Smuggler plan. For example, it calls for lodgepole “brood trees” infested with mountain pine beetles to be removed when found in sufficient numbers. Most of the first priority lodgepole treatments are slated to take place east of Smuggler Mountain Road, beyond the observation deck. Some work would eventually occur on both sides of the Hunter Creek Cutoff, the section of road that connects the observation deck with the Hunter Creek valley. 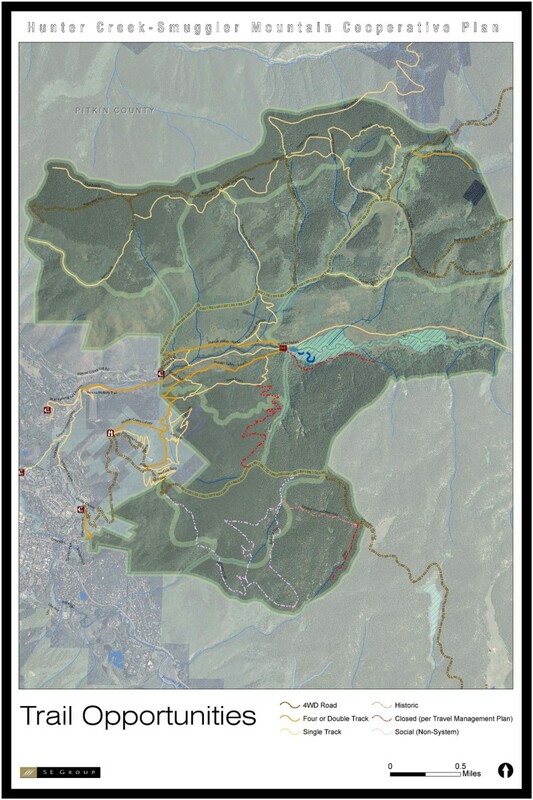 If the plan is approved and implemented, this is the area of greatest impact to hikers and bikers doing the popular Smuggler-Hunter Creek loop. Other, more remote, sections of the tree-cutting plan are near Four Corners and the top of Red Mountain. These projects may impact popular trails, including the Sunnyside/Shadyside, Secret, Hobbit, and Van Horn Park trails, and sections of the upper Hunter Creek and Four Corners-Lenado trails. 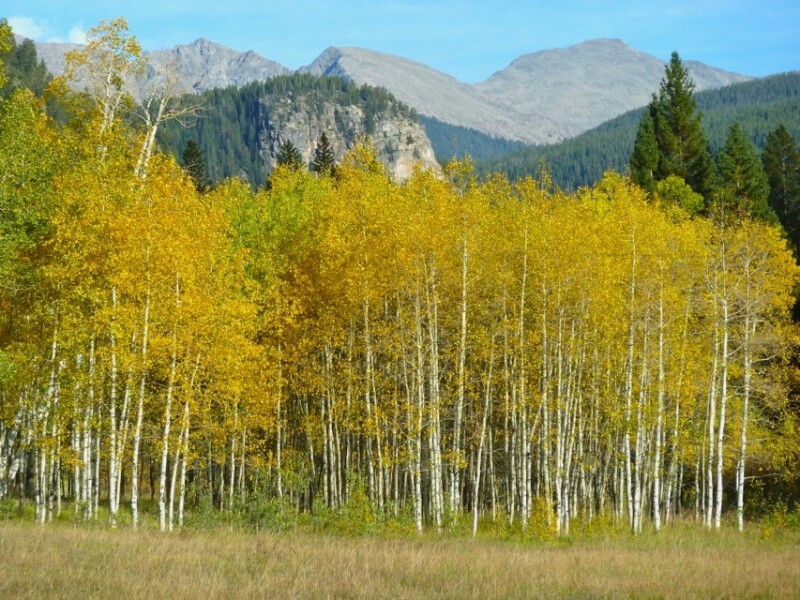 Another forest treatment targets about 280 acres of aspen groves that will be cleared with patch cuts in an attempt to restore their health and the habitat of aspen grove-dependent species. Treatments of aspen groves will clear patches up to 2 acres and will mostly take place southeast of Smuggler Mountain Road, far above the observation deck. Other aspen treatments will take place higher on Smuggler Mountain where the road climbs past the cell phone receptors toward Warren Lakes. Wilderness Workshop is alarmed by these proposed “patch cuts,” where smallish sections of forest would be clear cut, leaving a patchwork quilt effect across sections of the forest. The project proposes 1- to 2.5-acre patch cuts on up to 300 acres of lodgepole and 0.1- to 2-acre patch cuts on 280 acres of aspen. Wilderness Workshop also warned that patch cuts might compromise protected roadless areas, especially when using intensive mechanical means to remove trees. “If heavy equipment such as bulldozers were used, soils and vegetation could be damaged, degrading roadless characteristics,” Wilderness Workshop told the Forest Service. Mechanical treatments like thinning are planned on up to 60 acres of primarily oak brush, plus 50 acres of mountain shrub and 10 acres of sage brush to help restore wildlife habitat. Controlled burns would be used on shrubs on the outer reaches of the plan boundaries. 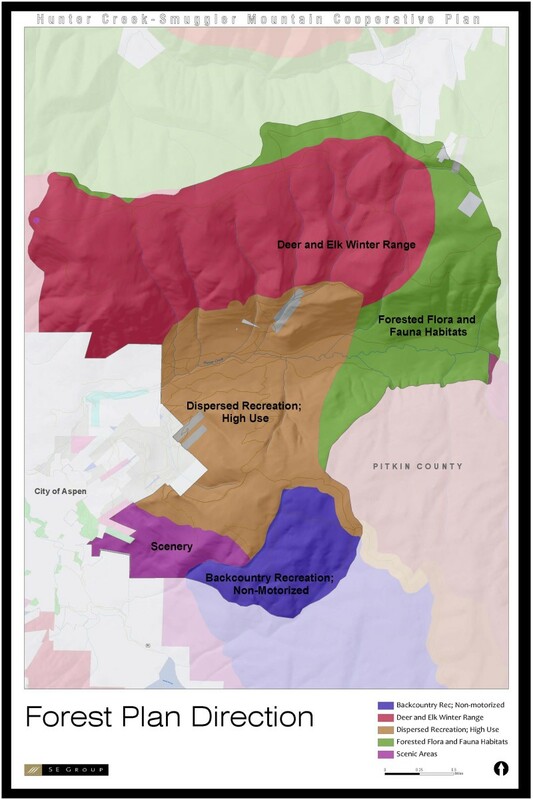 These oak brush treatments will take place above and south of the Smuggler Mountain Road trailhead in Aspen and also on the south flank of Red Mountain above the north entrance of the Hunter Creek valley. Slopes covered in aspens and evergreens flank the Hunter Creek valley floor above Aspen.Smith / Aspen Journalism. It is acknowledged by the Forest Service that “active management” of the forest involves cutting and removing trees, which requires logging trucks and probably helicopters. Why go through all the trouble to remove trees? The plan says proposed forest work is justified, in part, to stave off possible wildfire, which is identified as “a major forest management concern” for the Hunter-Smuggler area. “The proximity of homes and other infrastructure, as well as the desire to protect the scenic backdrop for the city of Aspen, drive the concern about catastrophic wildfire following the mountain pine beetle outbreak,” the plan states. Other reasons to perform the forestry work include managing climate change and improving overall forest health. Nonetheless, the tree-cutting proposal has brought forth concern from citizens. Private interest, public benefit or both? The plan contains a section heading, “Why here? 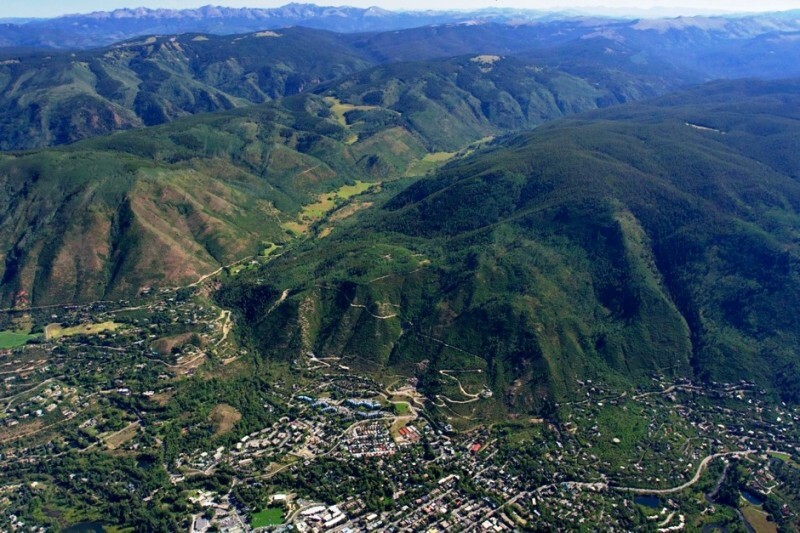 Why now?” The proffered answer is that the Hunter-Smuggler area is highly popular as “Aspen’s backyard” and that the plan is all about improving that backyard for the public good. “Smuggler Mountain and the Hunter Creek Valley contain some of the most heavily used trails in Aspen, as well as important wildlife habitat and stunning scenic beauty. However, the area has lacked cohesive management and vision, and thus, is now seeing degradation of trails, wildlife habitat and forest health,” the plan states. Forest Supervisor Fitzwilliams also noted that the plan represents a big step in forging new partnerships. Fitzwilliams reached back a few years, to before he had arrived at his post in 2009, by giving credit to others for the impetus of the plan. “The Forest must acknowledge that this process would not have been initiated if it weren’t for the nonprofit organization For The Forest, now a part of Aspen Center for Environmental Studies (ACES),” he wrote. However, this link has been a point of contention in Aspen since For the Forest was founded. There have been recurring claims that the current 20-year plan for the Hunter-Smuggler area is not so much about the concerns for broad public benefits as it is for private interests influencing public bureaucracies to act on their behalf. At issue is the influence of wealthy private interests who own upscale homes and valuable properties on Red Mountain and along Hunter Creek. In 2008, Gerald Hosier, Jerry Murdock and John Doerr, who own homes on either upper Red Mountain or in the mouth of the Hunter Creek valley, kicked off a tree-intensive project in 2008 called For the Forest. It was an ad-hoc advocacy group dedicated to protecting pine forests from the mountain pine beetle in the Smuggler-Hunter Creek area and across the West. For the Forest also sought to create a collaborative model of forest management, and the planning process for the Hunter-Smuggler effort is based on the same model. John Bennett, a former Aspen mayor who headed For the Forest, addressed the issue of those supporting For the Forest, but only to a limited degree. The Daily News pressed the issue. The article, written by Brent Gardner-Smith, then an Aspen Daily News reporter, carried a leading question. “Did the wealthy board members of the nonprofit For the Forest who live on or near Smuggler Mountain act in their own self-interest when they recently convinced the city of Aspen and Pitkin County to spend $45,000 to cut and remove 120 beetle-infested lodgepole pines on Smuggler Mountain open space?” the article asked. This tone was mirrored two years later in an Aspen Times headline from January 2011. “Does cash drive decisions on saving the forest?” the Times asked about a project that was not directly connected to For the Forest. The Times reported that the Pitkin County commissioners took exception to a proposed Forest Service plan to deal with mountain pine beetle at local ski areas, plus remove 3,000 dead or dying trees from the national forest near Starwood, an exclusive subdivision near Aspen. Private funding from the Starwood homeowners association was to cover the cost of cutting the trees and flying them out via helicopter. “Commissioner Michael Owsley,” reported the Times, “questioned whether the federal agency is looking out for the health of the White River National Forest as a whole or only the areas where private dollars are available to deal with the impact of the destructive beetle epidemic. The Daily News in 2009 had latched firmly onto the self-interest angle. “After doing what he could to keep the beetles at bay on his private land, did Doerr start For the Forest to pressure the public sector to take action on the public land next door to his property?” the article asked. The Daily News reported that Doerr’s experience with fighting the mountain pine beetle dates back to 2004 when he hired foresters to cut down about 100 infested lodgepole pines on his Smuggler property. The forestry consultant who wrote a report on the proposed tree-thinning plan for Doerr was William Murray, who became scientific program director of For the Forest. Murray’s report came at a time when the mountain pine beetle epidemic was inflaming a regional panic in the northern Rockies over the cataclysmic epidemic brought on by beetles and their deadly boring into lodgepole pines. Reports likened this epidemic to the spread of the bubonic plague where entire forests and whole mountainsides were turning brown and red with dead pine needles in what was referred to as a red blight. In April 2009, For The Forest produced a film that provided shocking aerial views of red, dead pine trees and dead and dying forests near Silverton and Dillon Reservoir. The shocking visual of flying over huge swaths of destruction, all because of a tiny insect few had ever seen, brought apocalyptic visions to Aspen. Murdock wasn’t alone with his fears. In December 2009 Colorado’s congressional representatives united behind a bill to address the pine beetle. The bill established emergency areas for reducing the danger from fire and falling trees in beetle-kill zones. It also provided incentives to use forest materials for fuel. An even earlier incentive for forest projects goes back to the Healthy Forests Initiative, a law proposed in response to widespread forest fires during the summer of 2002. In all these forest plans the pine beetle is a constant source for concern. In June 2009, Colorado State Forester Kelly Rogers criticized the lodgepole thinning approach proposed in Aspen. The Aspen Daily News cited a letter written by the forester to Aspen city forester Chris Forman. Rogers’ dire forecast turned out to be hyperbole because the mortality rate was considerably lower. However, six months after her warning, the beetle project in Aspen was deemed a success. Removal of brood trees was also cited as a key part of the early project on Smuggler. “The project would not have been nearly as effective without that step,” said Gillette. Today, however, Wilderness Workshop is challenging the original rationale for lodgepole thinning: the impacts of the mountain pine beetle. Over the last three years, the mountain pine beetle epidemic has greatly declined, according to Wilderness Workshop, and the Forest Service and its partners have not acknowledged this in the draft Hunter-Smuggler plan. The Hunter-Smuggler plan calls for cutting infested and potentially hazardous trees so they don’t fall on people and property. Other treatments may include applications of verbenone, a hormone marker that is supposed to fool beetles into thinking the tree is already full – like hanging a “no vacancy” sign. Wilderness Workshop points out that tree mortality is not quantified anywhere in the plan’s supporting documents and that field trips, aerial imagery, and extensive time in the study area have revealed that a majority of lodgepole pine are not dead. 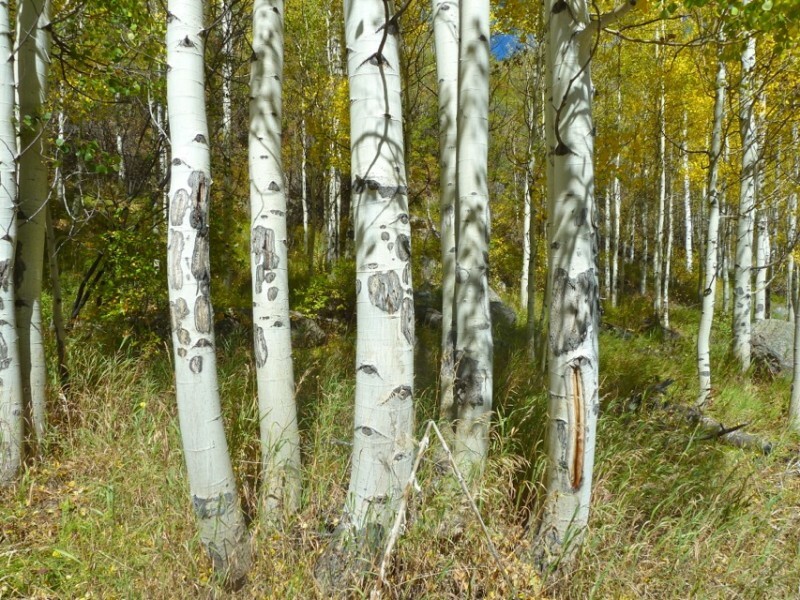 “The most recent 2012 survey on the adjacent Pitkin County open space found only two trees infected, and they were not killed,” Wilderness Workshop said. Either way, though, Wilderness Workshop thinks the Forest Service should reduce the amount of mechanical work and let nature take its course wherever possible. Rather than cutting and removing trees, those processes should include natural beetle kill and prescribed and natural burns to thin trees and create diversity in the forest understory. Due to the high profile location and emphasis on education “this project is an ideal opportunity to demonstrate the importance and feasibility of allowing fire back into our ecosystem,” Wilderness Workshop said. 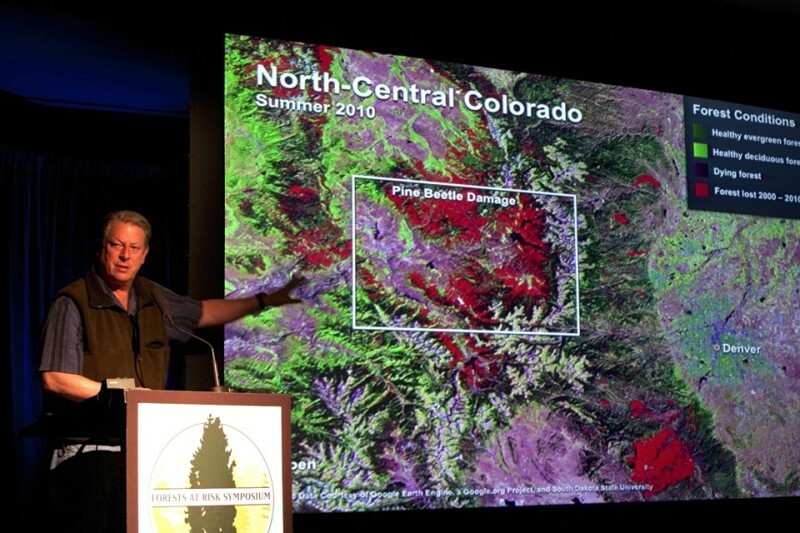 Former vice president Al Gore speaks at a forest health conference in 2011 at the Doerr-Hosier building in Aspen. In 2011 when the beetle plague seemed near its peak, former vice president and national environmental conscience Al Gore visited Aspen as the keynote speaker for a Forests at Risk symposium held at the Doerr-Hosier Center at the Aspen Institute, sponsored by For the Forest. Gore told the standing-room-only audience that climate change and forest stewardship are not just challenges for science. He equated them with moral purpose. For the Forest merged in December 2011 with the Aspen Center for Environmental Studies, which then assumed a lead role in the Smuggler-Hunter planning effort. John Bennett went on to other local causes and ACES became the recipient of funds toward Hunter-Smuggler forest projects. The current plan on which Fitzwilliams will decide reflects strongly back to what John Doerr said in 2009 when he described Aspen as a model. A summary of the Hunter-Smuggler plan evokes the same sentiment, namely an act-locally, think-globally vision. The Forest Services hopes that the “positive trajectory” of the cooperative process will extend beyond the original planning boundary of the Hunter-Smuglger plan, as nature, and the community, allow. Key to that is the new Future Forests Roundtable, a spin-off of a Hunter-Smuggler focus group. This forum has convened over 30 stakeholders. 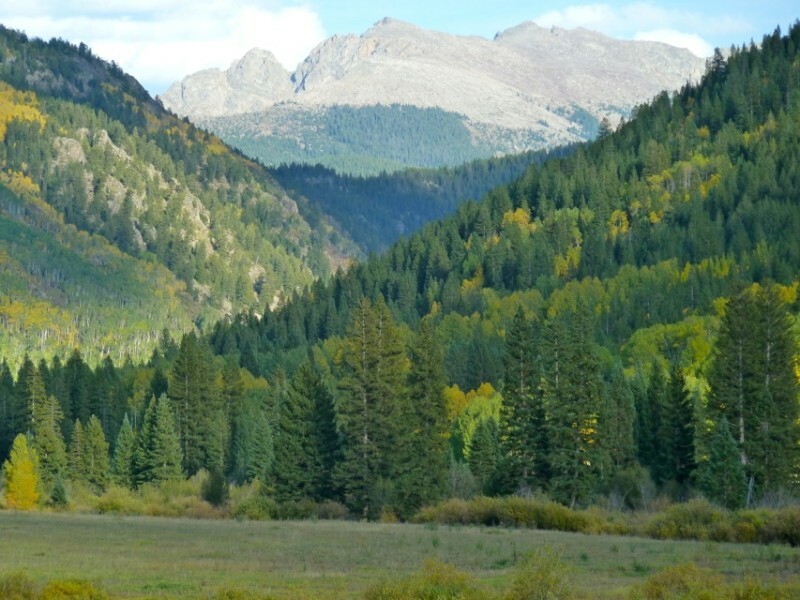 The primary goal of the roundtable is to help the Forest Service set Roaring Fork River valley priorities, both for the present and many years into the future. The secondary goal is to bring together local environmental nonprofit organizations for collaboration, innovation, and support on various projects. Should the current plan be successfully executed, the Hunter Creek-Smuggler Mountain Cooperative Plan, or a model of it, could reach far beyond the plan boundaries and into more of the 2 million acres in the White River National Forest. But that may depend on what Scott Fitzwilliams decides. Editor’s note: Below are maps of the Hunter-Smuggler area. The "Plan Direction" map from the Hunter-Smuggler plan.